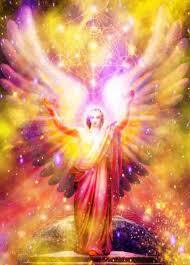 I am Metatron, Archangel of Light. I come to you with congratulations. I come to you with blessings and love. For now all of you present have really activated the ascension energies, not only within your four body system, but within your twelve body system. These energies will now continue to work until you achieve your personal ascension. Those of you that run ascension groups, we of course, the Lords of Light, know these groups, or the places where these groups are held as ashrams (this word ashram denotes a place where beings of like mind are gathered), so your ashrams will now become spiritualised. Your ashrams will become connected with a pillar of light to the Source, and through this pillar of light will flow all the codes, this information that is necessary and the Mahatma energy, into all the beings that gather there. Some of you will wonder who I am when I state that I am the Angel Metatron. I am the being which is responsible for light on a frequency which many of you cannot see with human eyes. Helios, the sun, is responsible for the light which illuminates all that you see. My energy, the metatronic energy, is the source of the electron and the microtron. The microtron is an energy which is now, you could say, being beamed into your aspect of creation, your universe in which you live. This mictrotron spiritualises energy. You could say that in some ways this equates with the arrival of this energy which some of you will know as the Photon Belt. This coming of the Photon Belt has created much fear amongst many humans. Many humans in their cellular memory remember what it was like the last time these energies were present upon your planet. There was destruction, there was the collapse of civilisations. Social orders collapsed. Many people went through this process you humans know as death. But this time, my friends, spiritualisation is taking place. This microtron is being anchored into the molecular structure of all that lives, and when I say the molecular structure of all that lives I would presume (although in some ways that is dangerous with human beings) I would presume that all of you know that everything that exists is alive. Not only human beings are alive, not only your trees and animals are alive, insects and fish, the stones are alive. The mountains are alive. They are living beings. Because they move slowly, or maybe even stand still for what you would consider long periods of time, do not discount the fact that they are also alive. So the mictrotron spiritualises. The microtron is responsible for the lightening of you humans and your surrounding forms. This process of enlightening will, as the word implies, turn you to light. Light is love, love is God, and God Is. This is all you need to know. Just allow this energy to work with you and flow through you until you all become light. Bless You. Adonai.